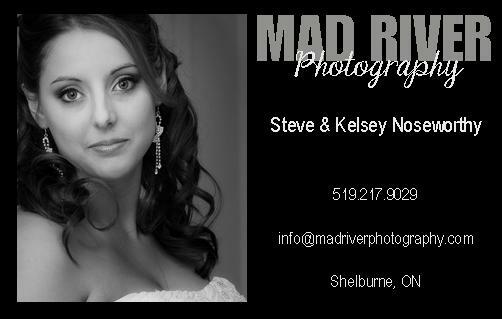 Mad River Photography is operated by Steve and Kelsey Noseworthy from Shelburne, Ontario Canada. We provide photographic services in the south-central Ontario region for weddings, portraits, and other events. Although we are new to “blogging” we are experienced photographers that take a great amount of pride in our work and strive for complete customer satisfaction. If you require photographic services in our region please contact us at info@madriverphotography.com or phone us at 519-217-9029.